Jennifer; 5) Agi Jambor, 1959 (divorced 1959); 6) Rosemary Clark, 1960. Career: 1900—stage debut as boy singer in Sweet Nell of Old Drury ; then callboy, prompter, and assistant stage manager at His Majesty's Theatre, London; 1911—adult stage debut in Gods of the Mountain ; 1912—U.S. stage debut in tour with Granville Barker's troupe in Androcles and the Lion ; 1915–19—served with the London Scottish regiment: Captain; after the war, returned to the stage; also taught at the Royal Academy of Dramatic Art, London; 1920—film debut in Build Thy House ; 1926—stayed in the United States after tour with The Constant Nymph ; 1928–33—contract with Theatre Guild: in Volpone , Marco Millions , The Apple Cart and other plays; 1933—U.S. film debut in The Invisible Man ; 1949—speaker with the Philadelphia Orchestra for Copland's A Lincoln Portrait ; 1954—in T. S. Eliot's The Confidential Clerk on Broadway. Died: 30 May 1967. Interview by H. Hall, in Motion Picture Magazine , March 1935. De Marinis, Rick, A Lovely Monster: The Adventures of Claude Rains and Dr. Tellenbeck (novel), New York, 1975. Soister, John T., Claude Rains: A Comprehensive Illustrated Reference to His Work in Film, Stage, Radio, Television & Recordings , Jefferson, 1999. Current Biography 1949 , New York, 1949. Obituary in New York Times 31 May 1967. Richards, Jeffrey, "In Praise of Claude Rains," and "Claude Rains—a Career to Remember," in Films and Filming (London), February and March 1982. One of the greatest advantages of the Hollywood studio system was the chance it afforded actors to develop their careers through steady employment and carefully developed roles over a long number of years. This was particularly true for those performers who excelled in character parts and supporting roles, as audiences came to recognize their faces and appreciate their work in a way that is no longer possible today. Of this group, Claude Rains enjoyed one of Hollywood's most successful careers, bringing his combination of sophistication, subtlety, and dry wit to a remarkably varied selection of roles. Rains also achieved a distinction rare among supporting players—sufficient individual popularity to allow him occasional starring roles as well. His ability to transcend the supporting category placed him in an unusual position among his contemporaries as one of the few character actors who was also a star. Rains had reached middleage and established himself as an accomplished stage actor in London and New York before his distinguished speaking voice won him the leading role in The Invisible Man . Rain's face appears only briefly in the film, after the character's death renders him visible again, but the strength of his vocal performance alone launched the actor's career in Hollywood. His work in films over the next three decades would win him four Academy Award nominations and include performances in such classic features as The Adventures of Robin Hood , Casablanca , and Notorious . Rains followed The Invisible Man with a starring role in Crime without Passion , in which he portrays a man driven to the brink of madness by an unhappy love affair. Rains would play similar characters in subsequent films, as his reserved, ironic manner proved an ideal mask for slowly crumbling sanity. Yet his range as an actor was extraordinary, and he portrayed villains and sympathetic heroes with equal ease, a facility which was put to frequent use during his years under contract to Warner Brothers. In 1938 he portrayed the dastardly King John in The Adventures of Robin Hood back to back with his warmhearted performance as the father of a family of girls in Four Daughters . The following year brought his first Oscar nomination, as best supporting actor, for his role as the corrupt senator who retains a spark of decency in Capra's Mr. Smith Goes to Washington . His performance in the Capra film exemplifies Rains's ability to portray characters who remain charming—and sometimes sympathetic—in spite of their actions. 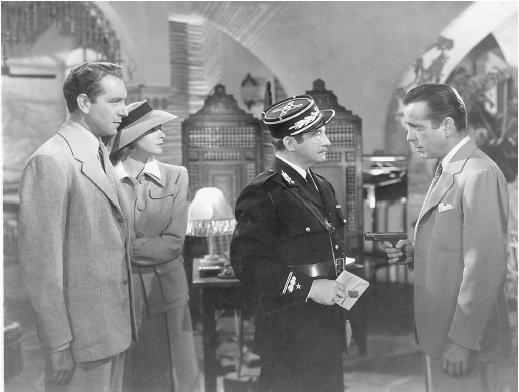 As Louis Renault, the sardonic French police captain who collaborates with the Germans in Casablanca , Rains remains an engaging figure throughout the film, and his eventual decision to join Humphrey Bogart in the Resistance comes as no great surprise. In Alfred Hitchcock's Notorious , Rains gives one of his finest performances as the Nazi sympathizer whose obsessive love for American agent Ingrid Bergman makes him a complex, pathetic figure and causes his final downfall. Rains also appeared in several films opposite Bette Davis, then at the height of her Hollywood career. In Now, Voyager , one of the classic "women's films" of the 1940s, he portrays Davis's wise, understanding psychiatrist, while his performance as her adoring, long-suffering husband in Mr. Skeffington brought him another Oscar nomination. The pairing of Davis's electric screen presence with Rains's precise, assured style lends a particular chemistry to their films together. Rains's work in later years included roles in Lawrence of Arabia , Twilight of Honor , and The Greatest Story Ever Told , and he remained, until the end of his career, an actor of consummate professionalism and skill.